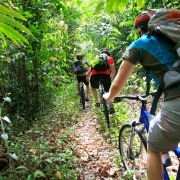 Cairns is an adventure-lovers paradise with numerous tours and adrenaline activities on offer. From white water rafting to bungee jumping and skydiving, and with hundreds of tours visiting the Great Barrier Reef each year, you're sure to find one, or a couple to try. 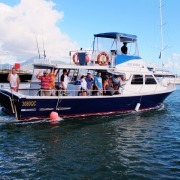 Cairns is the main departure point to the Great Barrier Reef with trips departing daily all year round catering to all levels of experience, whether you are a beginner snorkeler, advanced diver or do not swim at all we can find you the right reef cruise for your ultimate Great Barrier Reef adventure. Kuranda trips are very flexible with frequent departures throughout the day. We can tailor your trip to include either the basic Kuranda Train & Skyrail experience or the Ultimate Experience incorporating many attractions within Kuranda Village. There are many things in Cairns we like to lay claim to; we lay claim to being the only destination where two World Heritage-listed areas meet, being the gateway to the Great Barrier Reef, having one of the most spectacular coastal scenic drives in Australia, having the best rafting river across Australia and New Zealand, the largest butterfly aviary exhibit, the first Skyrail cableway, the tallest waterfall, the highest mountain in Queensland, the first walk through snake house... but one claim that we can surely hands down crown as our pride and glory is that Cairns IS the Adventure Capital of Australia. Where else can you start your day with a Skydive, Bungy for lunch and finish with an afternoon of rafting, and if you're somehow lucky inbetween you may even be able to fit in a quick heli flight or Zoom? You could actually fill up a whole weeks worth of action packed adventure including sea kayaking, horseriding, ATV action, Xtreme Rafting, parasailing, jungle surfing, scuba diving, river tubing, hot air ballooning, mountain biking, cable skiing, motorbiking, hiking and that's just for starters! So I think we are safe to say on that note that Cairns IS the Adventure Capital of Australia and if you're looking for adventure then you've come to the right place! All the adventure is right here! Our city sights are a tropical delight for new visitors to Cairns. Cairns is beautifully framed by a backdrop of rainforest clad mountains and palm tree lined beaches. Our tropical climate means that most activity is focused on the great outdoors, and with the pleasurable surrounds you wouldn't want to be anywhere else. City highlights include the Flecker Botanic Gardens, Cairns Esplanade including the swimming lagoon, Trinity inlet with its mangrove forests and abundance of wildlife, stunning palm fringed Northern Beaches and local rainforest swimming holes. A half day city sights tour offers a great introduction to to our tropical city and the Cairns region. Cairns is also the ideal base from which to explore the Great Barrier Reef with Green Island just a short 45 minute boat cruise away. If you're really looking to engage in the most quintessential experience of Australia's history and cultural, then a visit to Cooktown is a must. Cooktown is one of Australia’s most historically significant townships and one of Australia’s great last frontiers between “outback” and modern Australia. Cooktown combines isolated coastlines, rich history, Aboriginal culture and rugged Australian scenery. If you're into history, botany, adventure, getting away from it all, seeing the rainforest and the outback then this is the travel experience for you. Adventure North is a small, locally owned tour operation that offers 1, 2 and 3 day tours departing from Cairns to Cooktown daily. Their passionate guides have a wealth of knowledge and stories to share, which really makes for a cherished and memorable experience. Only here for a day? Well we can make it the best day of your life! Whether its action you're after, an enchanting experience in the rainforest or the opportunity to view the spectacular Great Barrier Reef, we have it all. With hundreds of tours departing daily, flexible departure times, and pricing to suit all budgets; we can tailor make a package to suit your requirements that will be sure to leave lasting memories of your time here in Cairns. Advanced bookings are recommended, and we will endeavour to supply the perfect weather for your perfect day! The Cairns region is home to a fascinating culture of Aboriginal Australians. For 18 Rainforest Aboriginal tribal groups, the Wet Tropics World Heritage Area has enormous significance as a living cultural landscape. The Yirrganydji people (aka Irukandji) are a group of Australian Aborigines who are the Traditional Owners and original custodians of a narrow coastal strip within Djabugay country, which runs northwards from Cairns to Port Douglas. The Djabugay speaking People (also known as Tjapukai) lived in the rainforests behind Cairns in Tropical North Queensland. Cairns has many exciting and educational experiences for visitors to learn more, first stop being the Tjapukai Aboriginal Cultural Park, Australia's most awarded Aboriginal Cultural attraction. Professional theatre, interactive demonstrations, live performances and a museum & gallery are all part of the learning experience. Rainforest Aboriginal people from the Wet Tropics are connected to different places according to their clan, family or tribal group. The Kuku Yalanji people are located in the Mossman area and are the only aboriginal tribe in Australia who still have their own language. They describe themselves as true rainforest people who live in absolute harmony with their environment. Learn about ‘Bush Tucker’ and the natural medicines that have supported Indigenous cultures for centuries on one of their Dreamtime Walks conducted from the Mossman Gorge Centre. Getting there is all part of the adventure. The journey to the Daintree travels along the Cook Highway north of Port Douglas and features beautiful scenery ranging from secluded palm fringed tropical beaches, hidden coves and rugged headlands to the rich green of lush sugar-cane fields and rainforest covered mountains. The Daintree River ferry is the gateway to the Daintree Coast and Cape Tribulation, and is the only cable ferry operating within tropical Australia. Once over the river there are many natural attractions to visit including rainforest walks, freshwater swimming holes and remote beaches. There are also plenty of adventure activities that take place such as sea kayaking, horse riding, jungle surfing, snorkelling, night walks and more. Guided tours depart daily from Cairns, and there are plenty of accommodation options should you wish to stay longer and immerse yourself in the rainforest experience. Our consultants would be more than happy to help tailor a unique rainforest package to suit. Dining can be an entertaining affair in Cairns. Forget the traditional restaurant set up with square table, simple cutlery and plain cloth, we want to take you on a dining adventure and give you a meal that will repeat on you... with fond memories of course! On the menu for starters we have Breakfast with the Birds at Wildlife Habitat in Port Douglas. Here you will be entertained by the friendly birdlife wandering freely amongst the tables whilst you tuck into a tasty full buffet breakfast. For brunch we have an exclusive sandy cay adventure. This once in a lifetime experience will whisk you away to your own private island by seaplane. Enjoy light refreshments & canapes for a romantic memorable experience with your loved one. Lunchtime choose from the Stockmans Lunch, Lunch with the Lorikeets or a delightful delectable feast of regional Tablelands produce onboard Food Trails Tours. The menu completes with a host of evening experiences including rainforest dining at Flames of the Forest, cultural dining at Tjapukai by Night, Aussie wildlife dining at the Cairns Night Zoo, or be wowed by Xtreme Illusions dinner and magic show. Just an hour in any direction of Cairns and you would have covered many types and styles of fishing such as lake, estuary, river, beach, reef, game and sports fishing. Lake Fishing - Lake Tinaroo is one of the most popular lakes where most of the world record Barramundi is caught. Situated on the Atherton Tablelands, Lake Tinaroo has become become a renowned recreational hotspot, for watersports, fishing, birdwatching, camping, and sailing. Estuary Fishing - Cairns Trinity Inlet is located in Cairns City and features over 90 kilometres of winding Cairns waterways to explore. This extensive mangrove lined estuary is home to a great diversity of species including the famous Barramundi, Mangrove jack and Trevally, Salmon, Grunter, Flathead, Fingermark and Gold Spot Cod. Estuary fishing is not weather dependant so most of these Cairns fishing tours operate daily and make for an ideal half day activity. Beach Fishing - Cairns has nine main beaches north out of the city starting with Machans Beach, and all make for some great and easily accessible fishing spots for all ages. River Fishing - River fishing takes place either a scenic drive north to the Barron and Daintree Rivers, or south via the Mulgrave Valley to the Russell or Mulgrave Rivers. Most prime tropical river and estuary fish can be caught from the Barron. Reef Fishing - Bottom fishing or Bottom Bouncing is a style of fishing most suited to catching reef dwellers. Great-tasting fish to be caught include spanish mackerel, coral trout, red emperor and nannygai or sweetlip. 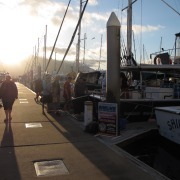 Charter boats specialising in bottom fishing operate from Cairns and Port Douglas daily. Game Fishing - From September through to December, the largest black marlin in the world migrate to the 150 mile stretch of the Great Barrier Reef between Cairns and Lizard Island. Serious big game anglers will fall hook, line and sinker to come to Cairns at this time of year and be a part of the action! From islands to outer reef adventures, sailing, scuba diving, snorkelling and more; there is a Great Barrier Reef experience to suit everyone. A visit to the Great Barrier Reef is a trip of a lifetime, and with Cairns being the closest gateway, makes this natural wonder easily accessible to all. We have a whole multitude of activites on offer to view the reef from every different angle possible, whether you're a swimmer or non-swimmer, young or old, flying in for a quick visit or staying longer, romance or adventure the possibilities are endless. We have full day adventures, cruise and fly options, scenic heli flights, glass bottom boat tours, scuba diving, sea walking, snorkelling, kayaking and the list doesn't end there. Visit an island or elope to your own sandy cay. Stay a little longer and sleep at the reef onboard a liveaboard cruise. For the more experienced diver take a multi-day expedition to the Coral Sea. Whether it's above the water or below the water, there are a myriad of ways we can tailor-make your Great Barrier Reef trip of a lifetime to suit. Like a child at the sweetie counter, you can pick and choose from all your favourite half day activites, then mix and match them around to suit your itinerary. The majority of tours are half day mornings & afternoons, so you can select your touring preferences and combine them into a full day of activity if you like, or lessen the pace and enjoy some active time followed by quality relaxation time in the tropics. Whether you're here for a long time or making a flying visit, looking for some adventure or scenic delights, there is a smorgasbord of half day activities waiting for you. Out of anywhere to take a hot air ballooning flight, Cairns rates as a remarkable destination. It is the most popular place in Australia for hot air balloon rides; it has one of the best suited climates and offers the best value. Ballooning takes place on the scenic Atherton Tablelands where you'll experience panoramic views of the rainforest mountains, rolling hills, fertile soils and bushland. Sunrise provides the perfect conditions for a hot air balloon flight and to witness the most beautiful coloured landscapes. If you're lucky you may well get to see a kangaroo or two. The spectacular balloon inflation display is all part of the excitement and build up. 30 minute and 60 minute hot air balloon flights operate daily year-round, with return coach transfers from Cairns, Port Douglas and surrounds included in the ticket price. Searching for a piece of paradise? Well you've found it right here. We have a number of fabulous islands and sandy cays sprinkled up the tropical coast, and with Cairns being a popular launch point, can make your dream of paradise a reality. Destinations include Green Island, Fitzroy Island, Frankland Islands, Low Isles, Lizard Island and sandy coral cays such as Michaelmas, Undine and Rudder. Each island paints a picture postcard of white sandy beaches framed by tropical palms and rainforest, where you can so easily snorkel straight off the beach and view the surrounding coral gardens. Other activities include scuba diving, semi-submersible coral viewing tours, glass bottom boat tours, reef & nature walks, sea kayaking, walking & exploring, relaxation and wellbeing. With Cairns year-round tropical climate, the Great Barrier Reef islands make an ideal holiday escape any time of the year. You can't say you've been to Cairns until you have done the inaugural Kuranda Train & Skyrail. Kuranda Village has been operating as a tourist destination since the 1970's with the famous Kuranda Markets being the drawcard, and which are still drawing visitors today. The first operation of the Kuranda Train commenced in 1936 and the Skyrail Cableway, a world first for viewing the rainforest in a safe and environmentally way, commenced operation in 1995. The Kuranda Train & Skyrail package is a complete experience in itself, offering two very different and special journeys to and from Kuranda. Time spent in Kuranda Village will allow you to explore the variety of market stalls inside the Original Markets and Heritage Markets, take a rainforest walk or enter the various wildlife attractions within the village. Kuranda Train & Skyrail is our top selling day tour, there are also options to add on various elements to your day including Tjapukai Aboriginal Cultural Park, Rainforestation, Birdworld, Australian Butterfly Sanctuary, Kuranda Koala Gardens, Hartleys Croc Park, or journey over to Green Island. Whichever you choose, we can help tailor a Kuranda package to suit. As we are a destination renowned for its World Heritage Listed Rainforest, no journey to Cairns would be complete without a rainforest experience. Easily accessible from Cairns is the Kuranda Train & Skyrail which takes you on a journey through the Wet Tropics Rainforest of the Barron Gorge National Park. Further afield to the north is the Daintree Rainforest & Cape Tribulation which features incredible untouched rainforests, rugged landscapes and beaches. The spectacular coastal drive from Cairns to Cape Trib is all part of the experience. Heading south we encounter the Wooroonooran National Park with attributes such as Josephine Falls, Babinda Boulders, Misty Mountains walking trails, Tully Gorge and the Mamu Rainforest Canopy Walkway. Finally the Tablelands Hinterland features a little bit of everything, with pockets of ancient rainforest and unique volcanic craters, to waterfalls, lakes, open farmland and rolling hills. There are a variety of daytrips available to these destinations, catering for a range of budgets and interests. Take a look through our list of rainforest trips to find out more. If you've never tried a dive before, or are thinking of learning how to dive then Cairns is the best destination to start. The region has an unrivalled reputation of being the premier learn to dive destination in Australia, and there are many reasons why. Our tropical climate lends itself as a fantastic destination for beginners with warm, clear waters and excellent visability, which on average is usually between 15-20 metres. From September through to February the conditions tend to be comfortable and calm, and with the Great Barrier Reef's conservative depths, make this an ideal spot for novices. Queensland has some of the highest safety standards in the world, and dive operators are required to conform to strict health and safety regulations specified by the Queensland Government. Our dive instructors and operators are some of the world's most experienced and awarded, providing first class tuition, equipment and safety standards. For those who are curious about giving scuba diving a try, then an Introductory dive is the first step. It requires no previous diving experience, all equipment and tuition is provided, and your dive instructor will be with you at all times throughout the dive. Most day trips offer the option to include an intro dive in your day. If you want to learn to scuba dive, then the first step is to take a PADI Open Water Diver course. Cairns has a number of purpose built dive training centres, with courses starting daily, some in different languages too. This practical course is designed to improve your diving skills and to give a deeper understanding of the principals of diving and diver safety. Within a few days, you can be enjoying the underwater world. A 5 Day PADI Open Water dive course is by far the most popular option. The adventure of learning to dive, as well as staying out on the reef for 3 days and 2 nights onboard a liveaboard vessel, is quite unique. Liveaboard dive trips visit some of the best dive locations on the Outer Great Barrier Reef, and provide some of the best scuba diving available. With roaming permits, your captain can select the most suitable dive location based on the conditions, water clarity and marine life of the day, so you can get the most out of your dive experience. For experienced divers, a dive expedition beyond the Great Barrier Reef to the remote Coral Sea is the ultimate on any divers wish list. Showcasing some of the best marinelife biodiversity in Australia, endless visability, plummeting walls, huge coral trees and golden gorgonian fans, you will be in awe of this spectacular oceanic wilderness. If hiring a car it is possible to make your own way to our various attractions in Cairns; it also gives you the opportunity to explore attractions further afield in our surrounding region, and take things at your own leisurely pace. Kuranda is just a 30 minute drive up the Kuranda Range, however if you don't want to miss out on the Train & Skyrail experience then we can organise for a bus transfer to return you to your vehicle at the end of the day, as the Skyrail Terminal and Kuranda Train Station are in two seperate locations. Wildlife Habitat at Port Douglas makes for a lovely half day out for the family, especially if you add on the Breakfast with the Birds. Leave Cairns at 8:30am and you will arrive in Port Douglas in good time to enjoy a full brekky feast. Afterwards wander off breakfast around the park, then perhaps enjoy an afternoon of shopping along Macrossan Street. It is a beautiful drive to Wonga Beach, about 30 minutes north of Port Douglas, and the horseriding makes for a fabulous day out. Horses will be allocated based on your experience and the beach is pristine. Why not combine your day of horseriding with a visit to Mossman Gorge or stop in at Hartleys Croc Park along the way. You can arrive at anytime of the day to the wildlife parks, bungy and Tjapukai with activities and action taking place all day long. The Atherton Tablelands provides a welcome contrast to the humid conditions and tropical rainforests of Cairns. Situated 500m to 1280m above sea level, its elevated position renders a comfortable climate that is generally cooler and ideally suitable for farming. The rich fertile soils and cooler climate means that the area has become a popular producer of dairy farms, fruit orchards, exotic fruits and other regional produce. The Tablelands also contains several small remnants of rainforest which once covered it, many of which are now protected in National Parks. The famous Crater Lakes are perfect for swimming and provide a beautiful rainforest backdrop, ideal for picnics. The Waterfalls Circuit lies right in the heart of the Atherton Tablelands with Millaa Millaa, Zillie and Ellinjaa Falls being a popular inclusion on many itineraries. Wildlife is abundant on the Tablelands and made simple to spot by a network of National Parks, bushwalks and wildlife spotting tours that are available. Popular destinations and attractions to visit include Yungaburra Markets, the Curtain Fig Tree, Lake Tinaroo, Mt Hypipamee Crater, Paronella Park to the south and Undara Lave Tubes to the west. Far North Queensland features a number of innovative wildlife parks giving you the opportunity to view some of our native wildlife species, and the much loved aussie icons up close. Many of our parks are set up to recreate a natural habitat whereby you end up being part of the exhibit! The Wildlife Habitat and Hartleys Croc Park are both examples of zoos that have created "immersion exhibits" which reflect the animals natural surroundings, and give you the feeling of being a part of the animals daily lives. All wildlife attractions include entertaining and educational presentations featuring the usual suspects of snakes, cassowaries, koalas, and crocodiles. A big favourite with many visitors is to cuddle a Koala, pat a kangaroo and if you're lucky you could even hold a baby crocodile! In the wild the Wet Tropics is home to about a third of Australia's 315 mammal species - 13 of these species are found nowhere else in the world. They include unique green possums, ringtail possums, fierce marsupial cats, rare bats, tree-kangaroos, a rat-kangaroo, a melomys and an antechinus. You can see many of these animals by joining a professional Cairns tour run by experienced local guides, who will share with you the best wildlife spotting locations in the Far North. 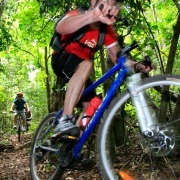 Tour combos are extremely popular as they allow you to maximise your time here in Cairns. They can be flexible around your itinerary and most importantly - they offer great savings! The 3 Day Reef, Kuranda & Cape Trib is our most popular combo package as it takes in the three main sights of the region - the Great Barrier Reef, Kuranda Train & Skyrail and the Daintree & Cape Tribulation. This package offers the best value for money, it operates daily and can be scheduled to work around your holiday itineray. Kuranda is an easy and flexible day to combine with many other attractions. Tjapukai Aboriginal Cultural Park and the wildlife attractions can offer an extra highlight to your day, or you can combine both Kuranda and Green Island to experience the best of the reef and rainforest in a day (perfect for those short of time). For those who want to pack in as much action and adventure as possible, then the Super Triple Challenge - Tully Raft, Bungy & Skydive is for you! Can't see your ideal package here? Then speak to one of our friendly consultants who will happily create a package to suit you. White Water Rafting has got to be the most fun and exciting way to discover the pristine rainforests of Tropical North Queensland. It’s a great bonding experience, and makes for an exicting team building activity. Raging Thunder Adventures pioneered rafting in Queensland back in 1984 with their first commercial trip on the Tully River. They have placed great emphasis on safety and training having pioneered many of the Swiftwater Rescue procedures and techniques used around the world. Their guides are trained to this high standard which includes Wilderness Medivac training. Each raft is controlled by a highly trained river guide, who will provide all the tuition (no experience is necessary). Inbetween navigating the rapids your guide will share with you the history and wonders of this magnificent landscape, which few get to see. The Grade 3 Barron River Half Day Rafting is perfect for ages 13 to 99, all fitness levels, and at only 20 minutes from the heart of Cairns, can be combined with many other activities to maximise your day. The Grade 4 Tully River is an extreme full day rafting experience with up to 45 rapids. Included is a BBQ lunch beside the river. For those after something at a more leisurely pace, give River Tubing a go. Suitable for all ages, you can enjoy a gentle float down the Mulgrave River relaxing in the beautiful scenery. Barron Rafting, Tully Rafting, River Tubing, Package Deals and more!